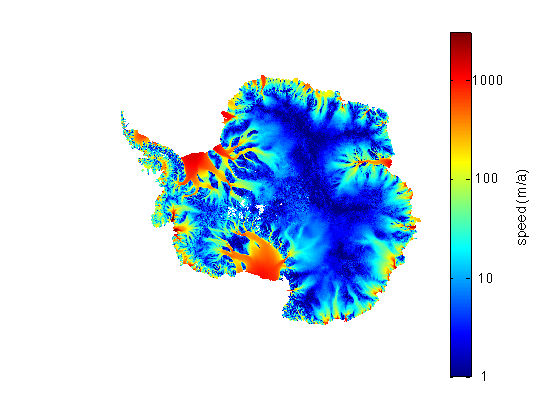 This function plots Antarctic surface velocity or grounding line data in a coordinate system that requires Matlab's Mapping Toolbox. If you don't have Matlab's Mapping Toolbox, or even if you do, I recommend using measuresps instead--it's a better-written function and does not require any toolboxes. measures 'gltype' plots grounding lines specified by 'gl', which plots all grounding line data from the Measures project, or any of the following strings to specify a grounding line from a specific year: 'gl1992', 'gl1994', 'gl1995', 'gl1996', 'gl1999', or 'gl2007'. measures('gltype','markerProperty',markerValue) formats the grounding line markerstyle properties with name-value pairs. 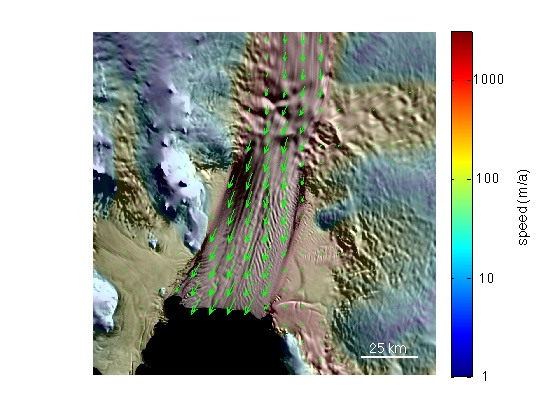 measures 'speed' plots a full continentsworth of ice speed data, downsampled to 4.5 km resolution. measures('speed',lat,lon) plots a 500-kilometer-wide map of ice speed at 450 meter resolution, centered at the location given by lat,|lon|. measures('speed','locationString') plots a 500-kilometer-wide map of ice speed at 450 meter resolution, centered at the location given by 'locationString'. With this syntax, measures uses the scarloc function to search the SCAR database for 'locationString'. measures('speed',...,'mapwidth',mapwidth_km) specifies the map width in kilometers. measures('speed',...'alpha',alphaValue) sets transparency of speed plot to an alpha value of 0 to 1. 0 is fully transparent; 1 is fully opaque. measures('vel',lat,lon) plots velocity vectors using the quivermc function. measures('vel','locationString') specifies map center location by its SCAR name. measures('vel',...,'mapwidth',mapwidth_km) specifies width of a velocity map. measures('vel',...,'quivermcProperty',quivermcValue) formats velocity vectors with quivermc name-value pairs. h = measures(...) returns handles(s) h of plotted object(s). 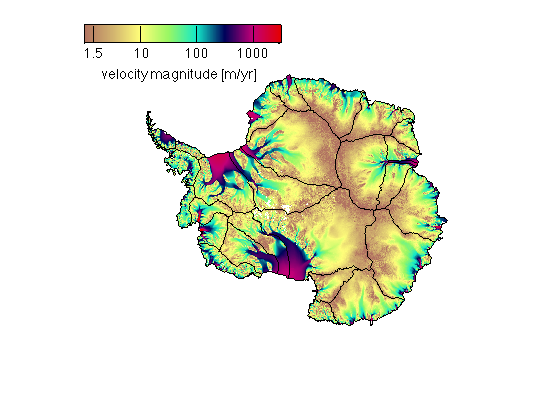 This particular function requires Matlab's Mapping Toolbox and the Antarctic Mapping Tools package. How fast is Totten Glacier moving? The measures function was designed to mate with the functions in the Bedmap2 Toolbox as well as modismoa. 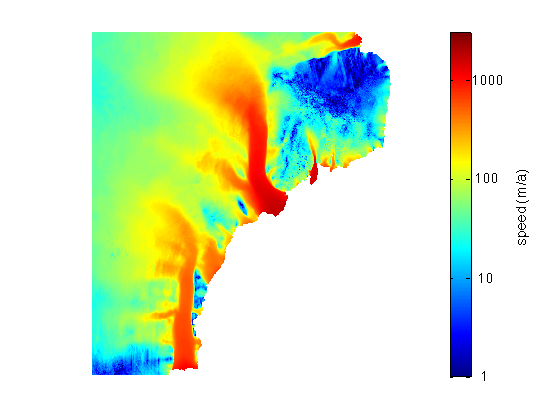 Here we plot a 200-km-wide MODIS MOA image of Mertz Glacier Tongue and overlay velocity vectors. For information on formatting velocity vectors, see the documentation for quivermc. Mouginot, J., B. Scheuchl, and E. Rignot. 2012. 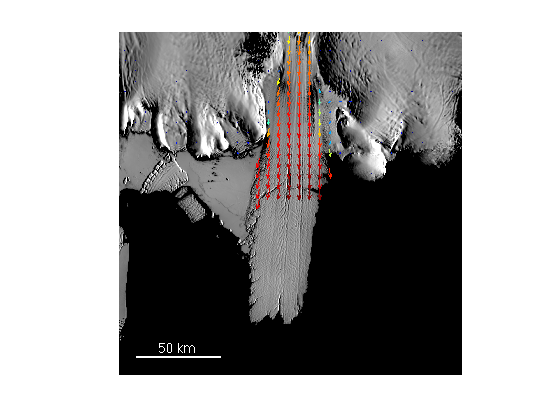 Mapping of Ice Motion in Antarctica Using Synthetic- Aperture Radar Data, Remote Sensing. 4. 2753-2767. http://dx.doi.org/10.3390/rs4092753 GROUNDING LINE DATA: Rignot, E., J. Mouginot, and B. Scheuchl. 2011. 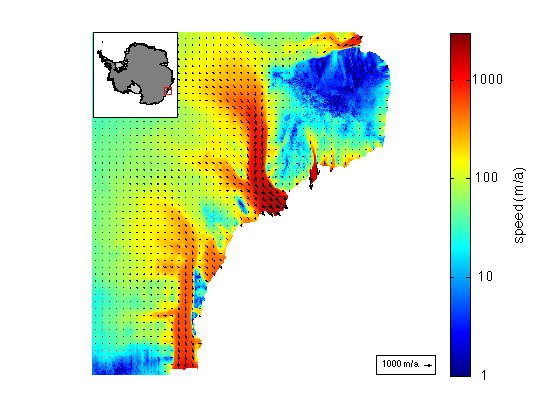 MEaSUREs Antarctic Grounding Line from Differential Satellite Radar Interferometry. Boulder, Colorado USA: National Snow and Ice Data Center. http://dx.doi.org/10.5067/MEASURES/CRYOSPHERE/nsidc-0498.001. This function was written by Chad A. Greene of the Institute for Geophysics at the University of Texas in Austin (UTIG), July 2014. Updated August 2014 as a plugin for Antarctic Mapping Tools.